A Walk to Beautiful tells the stories of five women in Ethiopia who are ostracized by their family and villages due to their suffering from obstetric fistula, a serious medical condition caused by failed childbirth under conditions of insurmountable poverty and inadequate health care. These women live in isolation with a sense of loneliness and shame due to rejection by their own. Each of these five women choose to reclaim their lives by taking the long and exhausting journey to the Addis Ababa Fistula Hospital so they could receive the medical treatment available only there. Upon arriving at the hospital, the women are treated free of charge, resulting in new beginnings. However, not every patient can be cured, but each woman takes her own journey toward becoming independent and productive members of their communities once again. 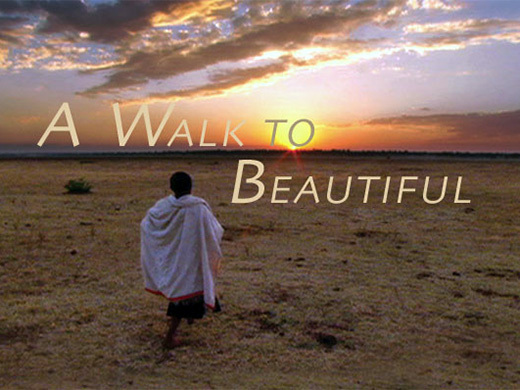 A Walk to Beautiful is a 2007 documentary film produced by Engel Entertainment, directed by Mary Olive Smith and field director Amy Bucher. The film premiered in 2007 film festivals and was chosen for the International Documentary Association Best Feature Documentary Film of the Year. A shorter version premiered on NOVA on PBS in May, 2008 and won the 2009 Emmy Award in the Outstanding Informational Programming (Long Form).